1. Complete the map and color France in blue and Australia in red. - Which hemisphere is Australia in ? ………………………………………………………………………………. - So, when it’s winter in France, it’s ………………………………………… in Australia. 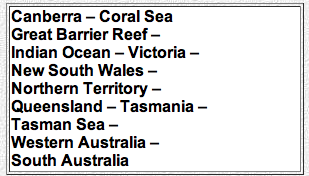 - Australia is composed of ………………… states and …………………. territories. - What is the capital city of Australia ? ……………………………………………………………………………. - What is the nickname of Australia ? Why ? ………………………………………………………………………. 3. Color the Australian flag. - Why is there the British flag on the upper left corner ? …………………………………………………………..
- What does the Commonwealth star symbolize ? …………………………………………………………………. 4. What is the currency in Australia ? In France, we pay in euros ; In Australia, they pay in ………………………………………………………………. - Who is the « Head of State » of Australia ? ………………………………………………………………………. - Who represents her when she is not here ? ………………………………………………………………………..
- Who is the Head of the Government ? …………………………………………………..
- What’s a « didgeridoo » ? …………………………………………………………………………………………. - Who are they ? ……………………………………………………………………………………………………. - What do they do ? …………………………………………………………………………………………………. - What is it ? …………………………………………………………………………………………………………. 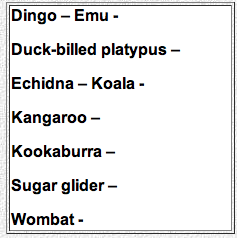 - Write the names of these Australian animals. - What are « dingoes » ? …………………………………………………………………………………………. - Where do they live ? ……………………………………………………………………………………………. - What is the « outback » ? …………………………………………………………………………………………. The Australians speak English but some words or expresssions can be different : it’s the Australian slang. Can you find the Australian slang words for these English words ? The Australians are very sporty. What sports do they practise ?